The Department of Kinesiology offers an interdisciplinary approach to the study of human movement, investigating the mechanical, neurological, biochemical, physiological, and behavior components of human movement. Health and wellbeing outcomes of exercise and physical activity are considered for a variety of populations. Our award-winning faculty has decades’ worth of experience educating students in the classroom and in research laboratory settings. Faculty expertise extends to many pressing kinesiology concerns such as physical activity and health, including fitness, health and wellness, intervention, and the measurement of physical activity; motor systems, including sensory-motor control and biomechanics; and physiology, including muscle damage, cardiovascular health and recovery, muscle fatigue and aging, and energy metabolism. The Department offers a wide range of academic programs, including Bachelor’s, Master’s, and Doctoral degree options. 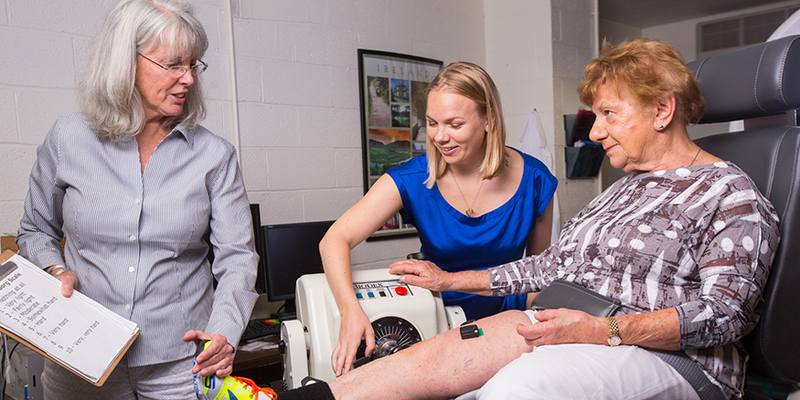 Kinesiology at UMass Amherst builds on a foundation of basic science in the areas of biology, chemistry, mathematics, physics, and statistics, which are then applied to the scientific study of human movement. The undergraduate degree is an excellent preparation for pursuit of an advanced degree that will lead to a career in medicine, research science, physical therapy, or academia. Kinesiology majors are prominent in the health and fitness industry, in the health care system, and in the growing biotechnology industry, particularly in areas related to cardiovascular, musculoskeletal, and metabolic health.